Dr. Edward Sazonov demonstrates the workings of his automated ingestion monitor. TUSCALOOSA, Ala. — Entrepreneurial teams at The University of Alabama will compete for funds to build prototypes, and advanced startups will demonstrate their innovations during AIME Day, an annual showcase of burgeoning technologies and business plan competitions Friday, April 15 on the UA campus. Students from the Culverhouse College of Commerce also will compete for a cash prize during the Edward K. Aldag, Jr. Business Plan Competition, which will be held at the Alabama Innovation and Mentoring of Entrepreneurs building at UA. The event is open and free to the public. AIME Day begins at 8:30 a.m. and concludes when judges’ results of the Crimson Innovation Program Participants are announced. The event also provides a platform for students and faculty members of UA-based startups to promote their products to members of the investment and business communities. A group of outside entrepreneurial experts will select winners from among the day’s participants. AIME, a part of UA’s Office of the Vice President for Research and Economic Development, focuses on growing concepts from UA researchers and creating testable prototypes to demonstrate the value the ideas bring to the marketplace. Directed by Dr. Dan Daly, it also helps start-up companies create business plans and apply for select funding opportunities, and it provides laboratory and office space, through UA’s Bama Technology Incubator, where companies can begin operations prior to full start-up phase. AIME Day will serve as an unofficial celebration of the progress AIME has made since its formation in 2009. Then, nearly all of AIME’s activity was comprised of support for research projects. Today, AIME has four companies that have secured more than $1 million in funding from external sources. Some companies, like Inventure, have since left the business incubator, attracted more investors, and grown into full-scale companies. Inventure, a Tuscaloosa-based renewable chemicals company, has hired more than 40 UA students, mostly graduates, Daly said. AIME Day’s prototype demonstrations will showcase the most advanced of AIME’s companies, like Soap n’ Go, an eco-friendly, degradable washcloth that doesn’t need water, and AccuBite, an automated ingestion monitor sensor worn around the ear that tracks food consumption. 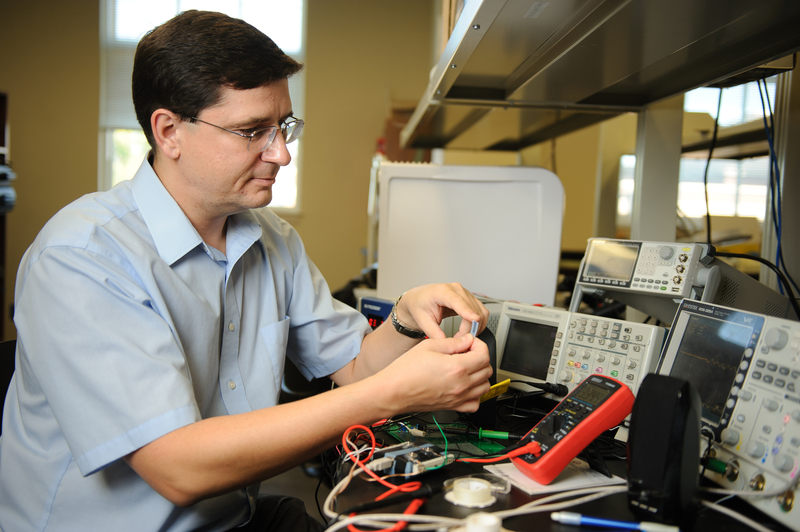 Dr. Edward Sazonov, UA associate professor of electrical engineering and creator of the sensor, secured a $1.8 million grant from the National Institute of Health in 2014. He said he’s working with AIME to prepare for the marketplace.